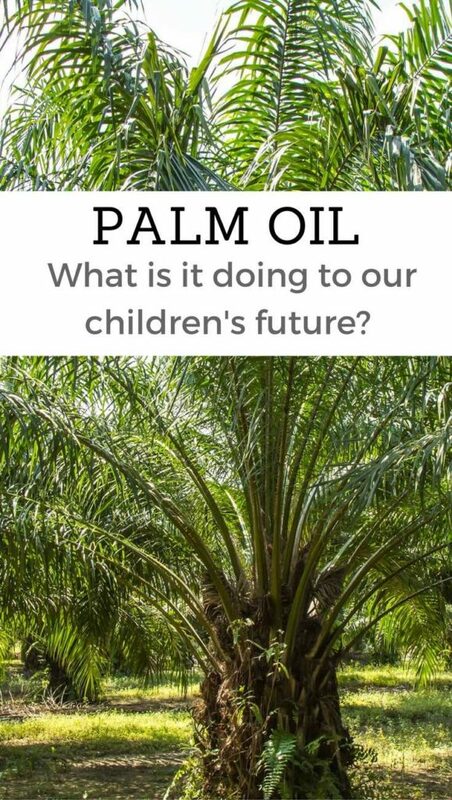 You are here: Home / Blog / Palm Oil – What is it doing to our Children’s future? Palm Oil – What is it doing to our Children’s future? As a mother of two young children, and a teacher, there are a few topics that I am very passionate about. One of these include healthy eating and nutrition for children and another one is creating a sustainable environment for our children to grow up in. These two issues actually go together, and while one of these things I have a lot of control over, the other requires a global effort. We are on board with reducing, reusing and recycling (my 4 year old is a very strict enforcer of this one! ), but I have to confess that sometimes I forget about where things come from in the first place and how sustainable it is to harvest those products.. One of the big issues we have been made aware of recently is the massive environmental impact of palm oil. I knew that palm oil was bad, and when aware of it, I would actively avoid buying products with it in. What I didn’t know is that palm oil is in so many things. Over 50% of the goods you will find in the grocery store contain palm oil. That’s more than half of all supermarket goods containing palm oil. This figure really shocked me, especially when I realised how many of these products I was purchasing each week. With Palm Oil being found in everything from ice cream to lipstick, there’s no wonder that globally we are consuming over 74 million tonnes of palm oil a year, with this expected to rise to 128 million tonnes by 2022 (just 8 years away). The destruction to rainforests and ecosystems is almost too big to comprehend with these figures, so it’s easy to see why something needs to be done. While these figures seem quite overwhelming, like every global problem the solution starts with one person, one family, making a difference. The one thing that your family can do to make a difference is to know the difference between GOOD palm oil and BAD palm oil. Most of the palm oil on the market is the bad stuff, but there are companies jumping on board and looking for certified sustainable palm oil. That’s the GOOD stuff. 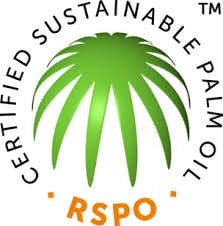 You can easily identify the GOOD palm oil by looking for the RSPO certified symbol. We are encouraging everyone to say YES to good palm oil, and to put pressure on the industry to change. By buying certified sustainable palm oil you are making a difference. Want to do more? Visit www.goodpalmoil.org to find out more information and make sure you SHARE their videos to raise awareness. Wow, I had no idea! I thought all palm oil was bad, but I can see that there is a way to make it ok for the environment. Thanks for writing this important piece. Wow – I had no idea about this really important issue. 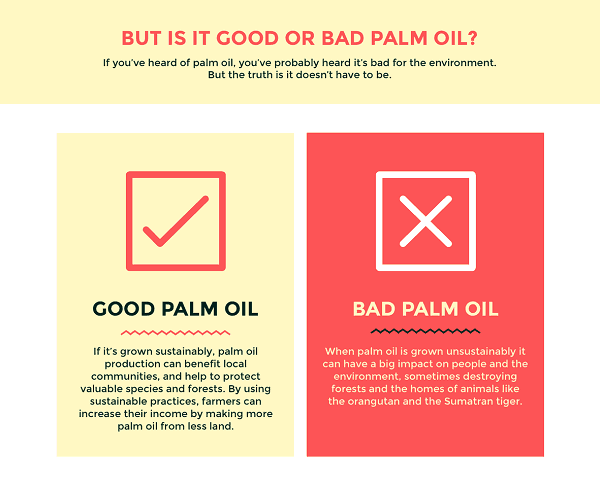 Palm oil, good or bad. I am so appreciative of your insight on this and will be more vigilant on being mindful about this! I was made aware of the environmental impact of palm oil about 18 months ago and yet buy sustainable. But this should be for everything. The meat and dairy industry is responsible for a lot of rainforest deforestation too! Honestly I’m pretty annoyed at humans and their reckless attitude towards the environment! I had no clue that palm oil was in so much! This is eye opening. Thank you for explaining the difference and the effects. Man, how can we know if it’s the good palm oil or bad? I guess we just need to be careful all around what goes into our bodies. I had no idea about palm oil. What is a more environmentally favorable product besides the GOOD palm oil? I had no idea about palm oil!!!! Now I feel like I need to read the ingredients for everyone of my products! Thanks for bringing awareness! I will always make sure to take note of this stamp every time I purchase a product with palm oil. I would rather leave a world that’s better for my kids than have them suffer the consequences of our actions. Don’t know much about Palm Oil so thank you for teaching me something new about it. I really didn’t know it was good. I had no idea that palm oil was in so many items. Thank you for making me aware that this was an issue. Eco-friendly products are what I am all for so this really is disturbing to me that there are things going on like this. I will definitely be more mindful. A little education goes a long way and I would imagine that most people (including myself) aren’t even aware of this issue…so thank you for educating us! Oh wow, this is something I’ve never heard about. What an important issue though, I want to read more on this! Thanks so much for sharing this with us. I never knew this about palm oil. I try my best to not use any oil when cooking so this is even better to learn. I wasn’t aware of all the troubles with palm oil, honestly. I will have to remember this for the future. I don’t want to damage the environment. I know nothing about palm oil and definitely didn’t know of the problems. I love learned stuff like this. I did not know all this, I always thought it was just Palm Oil and that some taste different to others. Great to learn something and thanks for bringing the awareness. I really haven’t given much thought to palm oil, I haven’t come across it in my travels. This is really interesting to see that there is a good and bad variety. So total blonde moment because up until reading this post I had no idea what palm oil was lol. Glad Im informed now!! Thanks! I really need to become more informed about palm oil, right now it is so hard to avoid! A few years ago I watched a tv programme that said that palm oil was actually very bad for our health. So I am really confused about it. In any case I try to cook more at home.